Join the discussion on our forums! Come discuss Deathwing, Dragonlord over in our dedicated Deathwing, Dragonlord discussion topic. Possibly the best card to get from Myra Rotspring. REALLY cool art, music and effect. Wish I had him. Ultimate gameplan: let Deathwing, Dragonlord summon Deathwing. 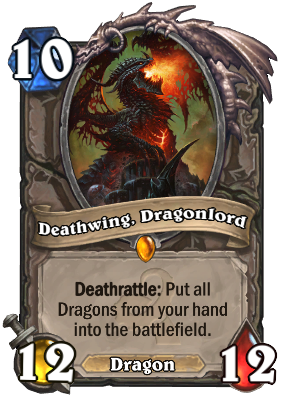 This could have been Galakrond instead of a second Deathwing with a cropped title. Why doesn't this card have it's own animation yet?? His attack sound!! The first syllable sounds exactly like the evil bob random event from old school runescape! Funnily enough I see where you're coming from. Also sounds like a ranged/magic attack. Finally he's playable in ramp druid, and god this card is bonkers. If you manage to play him which isn't really that hard anymore, he pretty much ends the game in a matter of 2-3 turns. The best card description: To his credit, Deathwing really took to heart the feedback he was receiving that he needed to be "more of a team player". How do you upvote someone's reply twice? Quick question...how do Dragons kneel?